To guard his hoard, King Thror set a watch upon his gate. Dwarf soldiers, well-trained and armed with swords, axes and long spears mounted an unending vigil at the entrance to the underground city. Stoking the forges of the Mountain kingdom and harnessing the skills of Middle-earth greatest armorers, Thror clad his regal Erebor guards in thick plate and square-edged helms, ornately etched and engraved with snaking patterns befitting the protectors of the world's greatest treasure. Sculptor Gary Hunt, who helped bring The Hobbit trilogy to life on screen, had the honor of crafting this noble piece to stand proudly among your 1:4 scale helm collection. 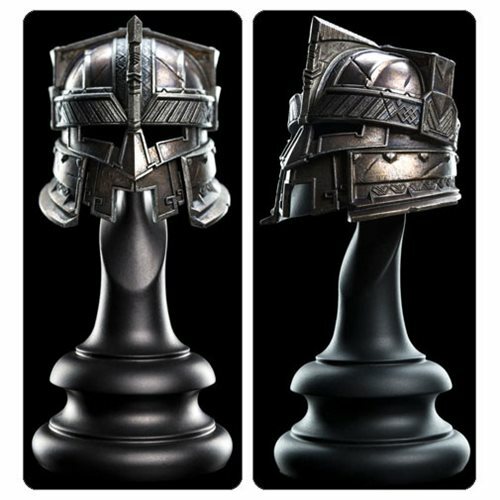 The Hobbit The Erebor Royal Guard's Helm 1:4 Scale Statue is made from polystone and comes in an edition of just 750.